Jahrestagung 2015 | Arbeitskreis Historische Friedens- und Konfliktforschung e.V. Jahrestagung 2015 | Arbeitskreis Historische Friedens- und Konfliktforschung e.V. 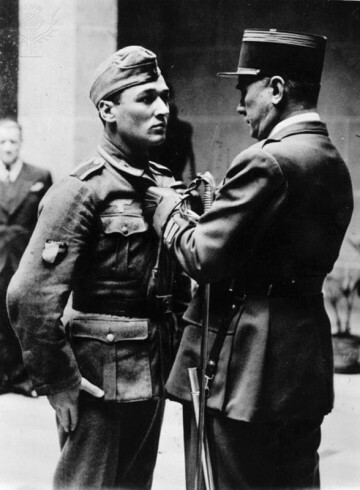 Awarding honours to French soldier (1942). Photo: akg-images / Universal Images Group. ‚The good soldier‘ – Ideal, instrument of manipulation or contradiction in itself? Annual conference of the Arbeitskreis für Historische Friedens- und Konfliktforschung (German Association for Historical Peace and Conflict Studies) in co-operation with the Norwegian University of Science and Technology, Trondheim and the Norwegian Air Force Academy. Over the last few years, a number of military conflicts have erupted or re-emerged all over the world. Older types of wars between national states have largely been replaced by civil wars, terrorist or guerrilla wars, and military and „humanist“ interventions by third-state actors. What has remained a constant, though, is that all participants in the conflicts evoke an ideal of the good soldier that is intended to legitimise participation in the conflict and to secure the allegiance of the fighters. The conference seeks to establish the historical roots and developments of the normative ideal of the good soldier and discuss the norm in its variety of meanings and ambiguities. The aim is to identify what attributes identify a ‚good‘ soldier at specific points in history and to explain how these attributes were interlinked with military, political as well as wider societal needs. Who was involved in the production of the norm of the ‚good‘ soldier? How was the norm promoted and implemented, and which purposes did it serve? Is the ideal of a ‘good soldier’, which is after all a moral category, not a contradiction in itself, given that the use of violence is not only part of the soldier’s job, but his raison d’etre? The international conference will take up these questions and debate the historical construction of normative ideals of ‘the good soldier’ and their usage both as a guiding principle for soldierly behaviour as well as promotional tool. At the same time it will analyse the question of how these norms were embraced or rejected by individual soldiers in different national armies, and how they themselves viewed their role in the military and war. The conference aims to bring together young and well-established scholars that adopt historical, sociological, military-strategic, cultural, gender, philosophical or theological perspectives to allow fruitful, transdisciplinary discussion. The focus of the conference lies on norm settings in national armies, both European and Non-European, from the 19th until the 21st century. Armed forces of international organisations, such as UNO, as well as paramilitary units or irregular troops are therefore excluded.